A common refrain on right wing radio and cable news stations concerns the pernicious "liberal media bias" aimed at indoctrinating Americans into accepting a socialist nightmare world. All these commentaries railing about the "War on Christmas," gay TV characters or really any art or culture that adopts a frank, realistic, adult attitude towards life, they all imply the same thing. Liberals are using the media and government to convert "real Americans" to give up their faith and their belief in capitalism, and embrace some kind of utopian atheist hippie fantasy. Never mind the fact that almost all of this media is owned by massive, multi-national conglomerates that have no clear or direct progressive agenda, and often support candidates from across the aisle. It's just completely nonsensical, the notion that millions of Americans independently have decided to lure their fellow citizens into debauchery, ungodliness and Communism via cartoons. So you might have a good, God-fearing, conservative American, but have her watch too much "Ellen" or "2 Broke Girls," and suddenly she's moving to Portland and illegally downloading Mao's Little Red Book to her new stolen Kindle Fire. Keeping this in mind, it's only natural that a lot of conservative media critics' focus would return again and again to children's programming. After all, who will be more susceptible to a persuasive message than young people who don't already have clearly-formed opinions about American politics and global events? But even understanding the logic of why conservatives make these kinds of arguments doesn't make them any less silly. This list examines children's films and TV shows that have inspired terrified, paranoid conservative rants. How could it be possible for anyone to doubt the good intentions of Spongebob or Dora the Explorer? Read on and find out. 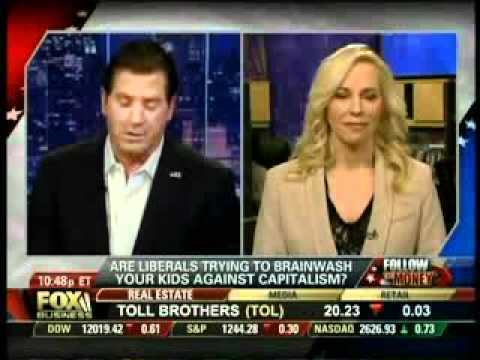 Fox News commentator Eric Bolling did not appreciate seeing oil executives portrayed in this way. Let me repeat that: someone actually took offense to the way that a movie about a bunch of felt puppets putting on a telethon was portraying wealthy Energy Industry insiders. I guess he decided to talk about it on his TELEVISION SHOW because there was nothing important happening in the entire world that whole day. Mocking response to the Muppet debate on Fox was fast and overwhelming. The Twitter hashtag #GOPMuppetHearings, suggesting other arguments Republicans might make against Henson's famous creatures, blew up almost immediately. #GOPMuppetHearings Mr. Gonzo, were you not convicted of transporting poultry across state lines for immoral purposes? 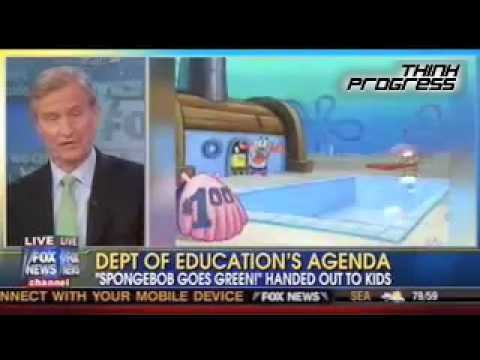 But putting aside her inability to follow the action of a show that is primarily designed for the under-10 set, Carlson and her co-hosts go on to make the case that Spongebob is teaching children inaccurate information about global warming. Specifically, they argue that Nickelodeon is pushing "a global warming agenda," because they're not "looking at the issue from both sides." Things get REALLY dicey when Steve Doocy tries to actually voice the "other side" of the global warming debate, which winds up being a lot of evocative gestures and disassociated ramblings, such that you'd get if you asked a schizophrenic to explain why he has to pause every 4 minutes to speak to the King of Outer Space that's hiding in his knapsack. Basically, there are many sides, and sometimes the planet gets hotter and colder, and f**king magnets, how do they work? The episode of Spongebob in question, by the way, doesn't so much argue for any kind of practical solution or policy change to offset global warming. The Fox and Friends crew was just upset that they acknowledged it was a thing at all. Apparently, voicing both sides of the global warming debate means shutting up and also shutting the hell up. The Simpsons attracted a lot of negative attention in its early days from conservatives, mostly for glorifying the Simpson kids - rebellious "underachiever" Bart and lefty intellectual elitist Lisa. But as it aged, the show became a more general political satire, sending up the silliness and overreach of both political parties. O'Reilly didn't like a Simpsons joke in which an alternate slogan was suggested for the Fox News network: "Not Racist, But #1 With Racists." This, of course, wasn't the first time The Simpsons took a swipe at Fox News, or other Fox networks more generally. The Simpsons Archive has a good round-up. But O'Reilly took it upon himself to ensure it would be the last, blasting the Fox executives who allowed the joke on the air as "Pinheads." Of course, the criticism didn't stop The Simpsons. (It probably just encouraged them.) 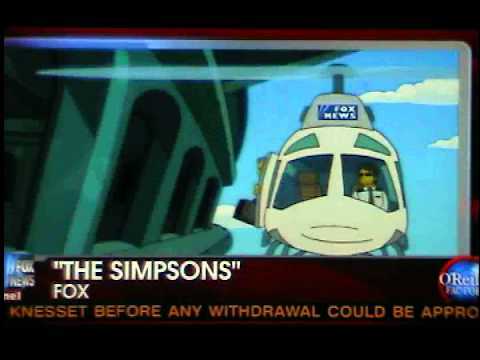 The following week, the same helicopter was back, this time with the Fox News slogan "Unsuitable For Viewers Under 75." "Deport Dora The Explorer Now!" The flare-up started in the aftermath of Arizona's controversial illegal immigration bill. You know, the one that let police basically stop anyone who looked like they might be an illegal immigrant (whatever could that mean?) and check for their papers. Cause when you think "America," you think armed authority figures stopping you on the street and demanding to see your identification. As a satire of the law, someone had made a Photoshopped image of little Dora the Explorer, beat up and under arrest, presumably for being in America illegally. This led to a slew of editorials and social media posts arguing that Dora herself was intended as pro-illegal immigrant propaganda. See, if your children learn to love Dora and her deliberately easy, leading question, they might start seeing immigrants as people. I guess. It only got worse when Nickelodeon representatives refused to comment on Dora's immigration status. Both because it's a pretty offensive question and, you know, that whole "no one over the age of 3 actually believes this is a real person." I mean, if you want to get technical, Dora was created here in America and then was exported (or IMMIGRATED) to more than 25 other nations. So she's been going overseas and taking jobs from Greek, Finnish and Malay cartoon characters! Would you say this whole thing is completely ridiculous?